Out of Africa Wildlife Park is home to several animals that have been rescued from a desperate and hopeless fate. Some of the animals in our charge were previously abandoned, abused, illegally obtained, or confiscated. When release was no longer possible, all of these animals had one thing in common. They were in need of a home where they could be assured a life of safety, veterinary care, love, and enrichment…and with the confidence that they would never again be traded or sold. Through their preservation they have become ambassadors of their kind, inspiring us, educating us, and raising awareness of our exotic friends here and abroad. Every year, Out of Africa Wildlife Park receives many inquiries from people who would like to donate wild animals or exotic pets. In most cases we are unable to take them for a multitude of reasons. However, we are happy to review each animal situation on a case by case basis. If we cannot provide a home for the animal here at our park, we will help direct you to local and regional facilities and wildlife centers that can possibly help. Remember that “restricted” exotics must be processed through the Department of Arizona Game andFish following specific protocols. Feel free to contact us with your information at 928.567.2842. Plans for a pet should always include care for its entire lifespan. Remember that exotic animals are far more difficult to keep as pets. It was late 2008. A 15-month-old Bengal tiger was brought to the attention of Out of Africa Wildlife Park founders Dean and Prayeri Harrison. The tiger was desperately in need of a home. She was illegally owned and living in a 30’ x 30’ enclosure with access to the owner’s house. She was sweet and didn’t bite under peaceful conditions, but we quickly discovered that she was terrified of vehicles, people she didn’t know, and any sudden movement by anyone. We had never seen a tiger so terrified. She had been living in isolation for so long that she had no way to relate to everyday activities. We also noticed that she did not play. This was a first. Her instinct to play had been suppressed by the isolation and treatment she had received. In order to bring her back to being a full-fledged tiger, it was necessary to find some young big cats for her. We brought in Zion and Ezekiel, two 11-month-old Indo-Chinese tigers already living at the park. All was fine for a few minutes until Zion wanted to play and playfully grabbed Vista in the neck, which is typical tiger frolic. Vista roared with fear and began back-breathing, a sign of terror in tigers. The youngsters were too much for Vista, so we removed them from her habitat. At that point we knew that in order to return Vista to normal, we needed to obtain some younger “big” cats. We contacted a friend who owns a zoo in another state. Fortunately for Vista, she had a baby white tiger, whom we have since named Chalet, and a baby lioness named Kumba. A few week later Vista had new friends who would not elicit fear. We also introduced Kora, a lioness cub, for Kumba’s sake, as well as two black leopard cubs, Enoch and Silhouette, who arrived a few weeks later. The new cubs all quickly became friends and have since grown up together. Currently, Vista lives with three other habitat mates: Kora, the lioness, and the black leopards, Enoch and Silhouette. Their companionship has created the conditions for Vista’s rebirth. She has remembered the instinct of play, and with each passing day, she sheds more of her shyness of vehicles and new people. Vista, who was once lost, is now found. 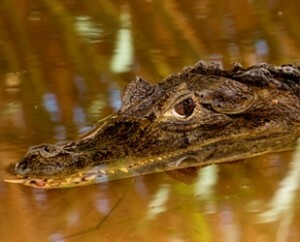 In 2003 the Arizona Department of Game and Fish confiscated a 5 1/2 foot long crocodilian known as a spectacled caiman. He had been owned privately for 13 years and had been kept in his house with no direct sunlight. The owner had moved to Arizona, where caiman are illegal to own privately, which eventually led to his confiscation. We were contacted as a possible home provider. Within three hours, the relatively gentle crocodilian was delivered to us. Spectacled caiman can be quite aggressive in the wild. However, Fisher was surprisingly docile and remains so today. We completed Fisher’s new habitat in the winter of 2008, with an indoor, climate-controlled domicile, and an outdoor area, complete with pool for sun basking…just the way he likes it. In the warm season, we feed him publicly on Saturdays at 3:30 p.m. after the Grizzly Show. Boom Boom was born on March 19, 1971, in an unrecorded location. 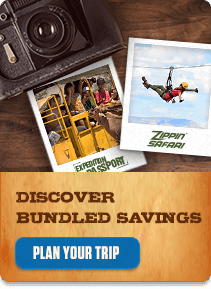 The first decades of his life saw him moved and sold repeatedly, first to the Carson Circus, then to Jackson Great Adventures, Six Flags in New Jersey, and finally the Catskill Game Farm in upstate New York. Two and a half years into his stay at the game farm, another rhino named Jack joined him to share his habitat. They each had an indoor stall but had to share the yard. Later the owner of the Catskill Game Farm decided to close after 73 years in operation. The animals were auctioned off to the highest bidders, including “canned” hunting ranchers. 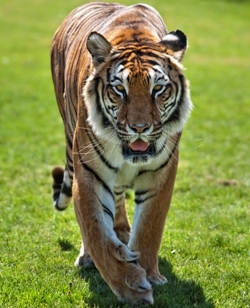 The owner of one of the ranches in Texas won the bid for Boom Boom and his enclosure mate Jack. Animal lovers mounted a protest. A caring man named Mark Ecko was made aware of the pending fate of the two rare animals and made a deal with the hunting ranch owners to buy the animals. But then he was faced with a decision: what to do with two massive creatures that had to be transported somewhere. Options were reviewed, accommodations were made, and a plan was formed. Jack found a home in Winston, Oregon, at Wildlife Safari, and Boom Boom was to go to Out of Africa Wildlife Park in Camp Verde, Arizona. International Animal Exchange in Ferndale, Michigan, carried out and coordinated transportation. Having only 10 days to build a temporary habitat for Boom Boom, the older of the two rhino’s, the staff at Out of Africa worked steadily until the semi-truck and trailer arrived. Inside were two huge beings, both in mammoth steel crates, with Boom Boom at the back of the truck. Park tractors were unable to lift him in his container, so Arizona Jobsite Concrete brought over a front-end loader, which worked in tandem with park equipment to lower Boom Boom to the ground in his steel crate. Then the loader dragged the crate over to Boom Boom’s temporary digs. But he was in backwards. With much patience and gentle coaxing, Boom Boom backed out of the crate and into his new home. He was terrified, everything was strange, and rhinos are afraid of any changes to their environment. Boom Boom jumped and snorted, whirled around and charged again and again. One of the large male lions next door rushed down the hill, charging at the chain link fence in an all-out effort to attack his new neighbor. But Boom Boom paid him little mind. He was already too frightened to realize there was a 550 pound lion a mere 40 feet away. His immediate, unfamiliar surroundings were far more bothersome. Many visitors, staff, and reporters watched as Boom Boom began his very slow adjustment. By the next morning Boom Boom had settled down, but it was already apparent to park co-founders Dean and Prayeri Harrison that he needed a much bigger and better living area. Dean prayed and was given a vision of where and what to build for Boom Boom so he could live his life in peace. A plan was drawn and work started immediately. The new enclosure included a heated block house, wet and dry wallows, and hundreds of trees, all on 6 ½ acres. His new habitat was completed in just 11 days. On November 21, 2006, at 4:55 p.m., Boom Boom walked across the main tram road and into his new habitat 150 feet away, a feat that took 7 hours in total. Within a week Boom Boom was quite comfortable, casually walking about freely, eating about 50 pounds of hay and grain per day. He rolled in his wet wallows and sunbathed in the warm Arizona sun. Boom Boom was finally home. For the next 5 ½ years Boom Boom made friends, human friends. He made us all feel the same, visitors and staff alike — special. Everyone believed they were his favorite. Boom Boom loved to be near people, and the staff never ceased to brush him. Hugs were common, and soothing expressions came from many passersby. Boom Boom was well loved. He, himself, seemed to exude love and acceptance of everyone. He was non-judgmental. He was everybody’s best friend. He made possible an invisible oneness between human and animal. Boom Boom’s life at the park was an exquisite example of Heavenly love. Animals are children. They live by feelings, in the moment, without judgment and without the concept of time. They are Heaven sent, a billboard for us to see God’s purest on earth. He was a champion of animal love, freely expressed to all he met, no matter our attitude, no matter our deeds. Boom Boom, we will always remember what you came to teach us. Thank you from all of us. 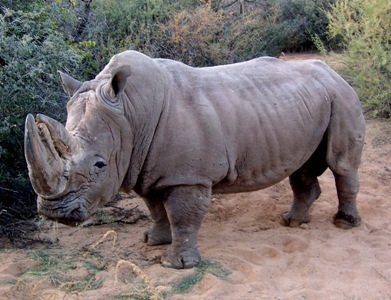 Our famous southern white rhino, Boom Boom, died on March 22, 2012, at the ripe age of 41. Boom Boom had a special way of making everyone feel good just by being near him. He will be greatly missed by Out of Africa park patrons and staff. 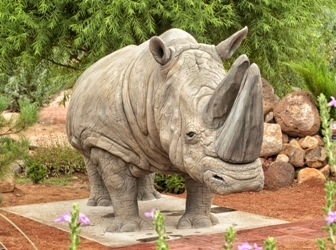 Today you can see a life-sized statue of Boom Boom at the park, thanks to the kindness of Cemrock™, who created this wonderful work of art to never forget a rhino named Boom Boom who touched all of our lives.